Edmund Ruffin, Virginia “fire-eater,” pro-slavery secessionist was said to have pulled the lanyard on the first shot Fort Sumter. – Charleston, SC -Thursday to Sunday. A South Carolina delegation of three men delivered a demand for surrender to Major Robert Anderson at Fort Sumter in Charleston Harbor. The message was from Confederate General P.G.T. Beauregard and stated that they intended to take “possession of a fortification commanding the entrance of one of their harbors . . . necessary to its defense and security.” They let Anderson know that they would not fire upon his position if he advised them of the time of the evacuation of the Union troops stationed there. 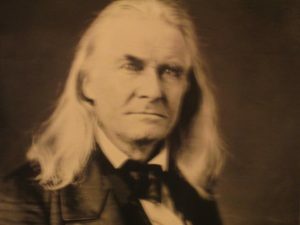 Anderson replied that he also would not fire except in response., but that he would evacuate on 15 April if he did not receive supplies coming from the Federal government. The Confederates were aware that a supply ship was en route and deemed the answer unsatisfactory. At 0430 on Friday a signal shot opened a barrage from the other batteries in rotation. Anderson had a garrison of 85 officers and men as well as over forty laborers who worked in the fort. They began to return fire at 0700. On Saturday, after thirty-four hours of bombardment, a rash of fires and destruction, and some minor injuries, Fort Sumter capitulated. The formal surrender ceremony occurred on Sunday at which time was the only fatality. When the colors changed and the fifty-gun salute concluded, there was an accidental explosion in a pile of ammunition that killed a Union private and injured several others.